Of the 23 players who dressed for Miami last season, 19 will back in the same sweaters this fall. But that doesn’t mean the RedHawks didn’t lose any talent from 2016-17. Anthony Louis wrapped up his college career as the team’s top point producer his senior year. Also departed are Justin Greenberg, who was a solid penalty killer, and Colin Sullivan, a two-way defenseman that could also move up to forward. Jared Brandt is also gone after a solid freshman campaign that saw him ascend to the top pairing. Joining the RedHawks for 2017-18 will be a class of seven, consisting of five forwards and a pair of defensemen. That’s a net gain of four, so Miami should have ample depth heading into this season, which has been an issue at time the past couple of years because of injuries. BoB breaks down how the RedHawks Version 2017-18 breaks down positionally. Two starters are out (Louis and Greenberg) and five are in. That means solid depth and lots of fierce, healthy competition for lineups spots each night on a team that struggled to produce offense after the first two lines. Miami returns 11 forwards, which means at the very least one of the newbies will be dress each night. Several of the freshmen have put points on the board in juniors, and Coach Enrico Blasi has a reputation for throwing young players into the mix immediately, so there is definitely plenty of opportunity for the newbies to carve themselves regular starting spots. Four returning RedHawks recorded at least 20 points last season – Kiefer Sherwood, Josh Melnick, Carson Meyer and Gordie Green. Sherwood was second in points only to Louis (14-24-38), and Melnick went 9-18-27 as the team’s top defensive forward. Meyer admirably missed just four games while suffering through mono, going 10-16-26 as he noticably ran out of gas down the stretch. Green turned it up as the season went on, as he had seven goals and eight assists the final 18 games of 2016-17. What Miami needs is more production from the remaining eight spots. Zach LaValle went 2-9-11 and big Willie Knierim scored four goals and seemed to be adapting well to the college game. 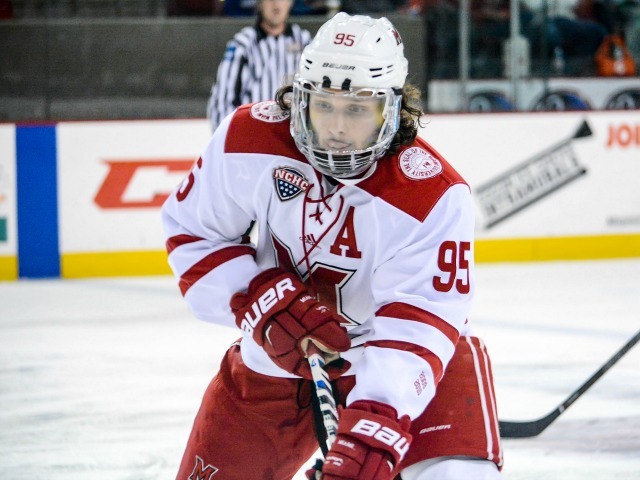 Karch Bachman has tons of speed and a great shot, and hopefully that will translate to more success for the talented Florida Panthers draft pick. That’s seven guys that should start for sure each night. Of the returning forwards, Ryan Siroky has become a strong penalty killer but doesn’t produce much offense. Carter Johnson played on the fourth line and managed three points in 35 games. Conor Lemirande is huge at 6-feet-6 but has just nine points in 103 games. Alex Alger played in 21 games and was an energy forward but finished with just one assist in 21 games. Those five spots would appear to be less secure on a team looking to generate more offense. It’s an intriguing unit. Austin Alger, Philip Knies and Casey Gilling were all scorers in the USHL and could press all of the above for their jobs. 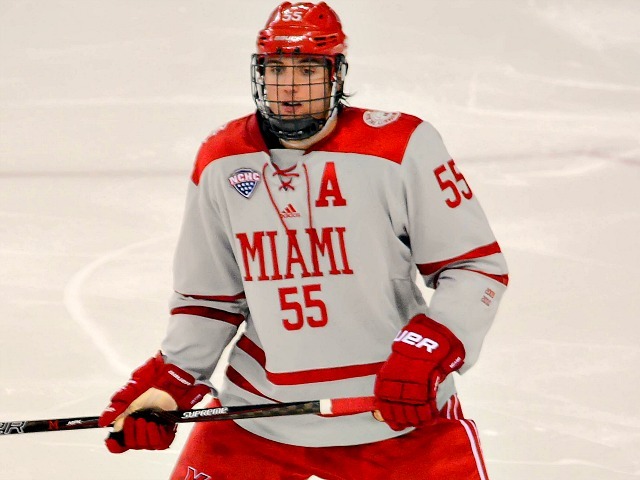 Miami was 45th out of 60 Division I teams in goals per game last season (2.53), and the RedHawks need to put the puck in the net more in 2017-18 if they hope to have success this season. This was a facet of the game in which Miami struggled in 2016-17, and two mainstays from last season and gone in Jared Brandt and Colin Sullivan. Brandt transferred to Niagara and Sullivan graduated. Captain Louie Belpedio was limited to 24 games due to various injuries and although he was not 100 percent when he did play, he racked up six goals and 11 assists for 17 points, the best scoring rate of his career. Grant Hutton is back for his junior season, and while he has been a shutdown-type D-man in his two seasons in Oxford, he scored nine goals in 2016-17. Scott Dornbrock went 3-10-13 last season and is one of the team’s best hitters. The other three returning blueliners are all sophomores – Grant Frederic, Chaz Switzer and Bryce Hatten. Frederic finished with three points in 2016-17 and needs to be more physical this season, as he is 6-3-201. Switzer got better as last season went on, and tallied a goal and an assist in 23 games. Hatten dressed just 11 times and did not record a point, but a major injury in 2015-16 stunted his performance, and he could take a huge step forward this season. The freshmen are Alec Mahalak and Rourke Russell, who should challenge for starting spots right away. Mahalak is more of an offensive-minded blueliner, tallying 26 points in 59 NAHL games, and Russell has a reputation for shutting down opponents. Two defensemen will have to sit each night, so that should up the ante for everyone involved each practice. At the banquet this spring, Ryan Larkin won the MVP award despite being a freshman. That’s pretty much all you need to know about Miami’s goaltending. Larkin logged 1,946 minutes last season, going 8-16-7 with a 2.77 goals-against average and .910 save percentage. Those numbers are mediocre until considering the quality of shots Larkin faced in 2016-17. 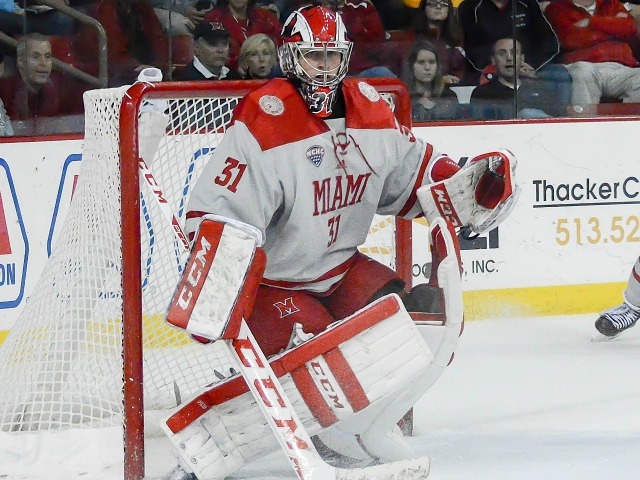 Miami only won nine games last season but that number would be lower if Larkin hadn’t been in net. 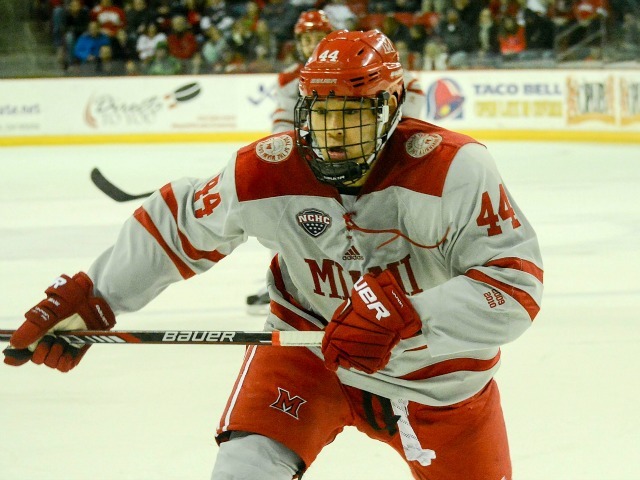 He was banged up a couple of times last season, most notably during the RedHawks’ NCHC playoff series, so hopefully he can stay healthy in 2017-18. Chase Munroe went 1-4 with a 4.25 GAA and .861 save percentage, but he sat much of the year and was under fire when he did hit the ice. Posted on October 5, 2017, in 2017-18 and tagged 2017-18 miami redhawks, carson meyer, gordie green, grant hutton, josh melnick, kiefer sherwood, Louie Belpedio, ryan larkin. Bookmark the permalink. Leave a comment.